Huawei is a company that has proved that it deserves to sit among Samsung and Apple as one of the top 3 smartphone makers in the world. This year, the Huawei P20 series was launched which features the Huawei P20 Pro, the smartphone with the highest DxOMark score among smartphones, thanks to the impressive triple camera setup. The phone packs a powerful Kirin 970 processor which was previously seen in the Mate 10 and Mate 10 Pro of 2017. Recently, we came to know that Huawei has already started working on the Kirin 980 processor and it is coming with the 7nm manufacturing process and a much powerful GPU. 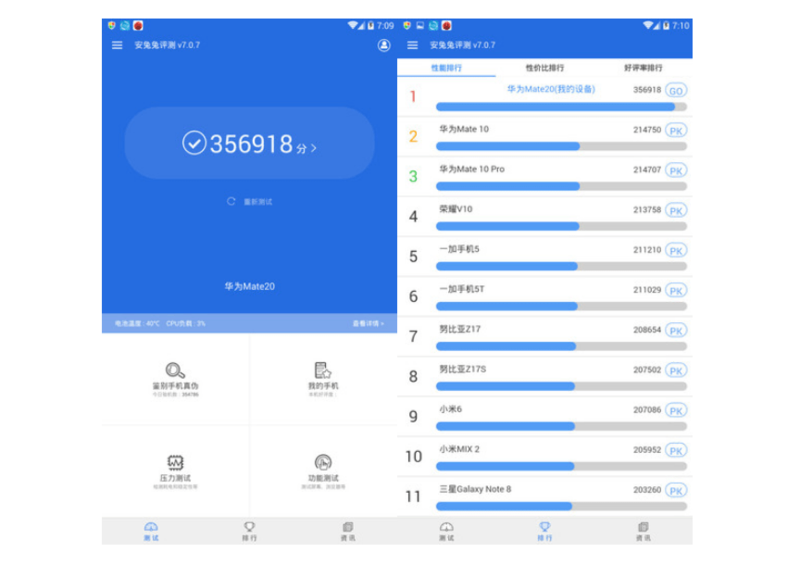 Today, the Huawei Mate 20 showed up on AnTuTu benchmark with a record-breaking score. There is no smartphone right now that has surpassed 300K on AnTuTu benchmark, and the Huawei Mate 20 is the first to do it. It scores 350,000+ which is a huge leap from the 210K+ score of the Kirin 970 processor. It is rumoured that the Kirin 980 will pack the powerful Cortex-A75 cores and a 2nd gen Neural Network Processing Unit or NPU, and a much powerful GPU than the previous generation. There is no information about the launch month yet, but we are expecting the phone to launch in October or November. The phone is surely coming with an in-screen fingerprint scanner since the Porsche Huawei Mate RS, which was launched last month, has the same. What are your views on the AnTuTu score of the Kirin 980 powered Huawei Mate 20? Do let us know via the comments section.